When you get started with HubSpot, one of the first big decisions to make is whether or not to host your website on the CMS. There isn’t a one-size-fits-all answer, but I thought it would be helpful to walk you through my pros and cons. Hopefully, by reading this with your business in mind, you’ll figure out whether the CMS is a good fit for you. Or, if you prefer, skip right to my preferred stack. Before we start, please know that while I love HubSpot, I’m not a shill. You’ll find dozens of articles about the CMS written by agencies that really want you to pick the CMS so they can sell you custom design and development services. That’s not me. HubSpot’s CMS is their built-in content management system. Think of it as WordPress or Squarespace with a landing page tool like Leadpages built-in and tightly integrated with your marketing automation tools. You can mix and match! For example, you can choose to keep your blog on WordPress and move your main site and landing pages to the CMS and it’ll be virtually seamless for your visitors. Let’s start with what I like about the CMS, in no particular order. One of the first benefits of the CMS, especially if you go all-in, is that it unifies your publishing tools. This can be attractive to small marketing teams with limited budget or experience. You can login to HubSpot and edit your homepage, publish a new blog post, or A/B test a landing page. Combined with the email and social tools, HubSpot starts to become your one true publishing tool, simplifying your marketing stack and making it easier to train new people. For must of us, however, the dream of an all-in-one is just that: a dream. I personally believe in using the best tools for the job, and I want my team to be adaptable. If they find it too chaotic to learn, e.g., HubSpot + Buffer + WordPress, then I’ve got bigger problems. Unification makes things convenient, but in 6 years of using HubSpot daily, I can’t think of one time I felt extremely hindered by having my site hosted outside the CMS. HubSpot templates built with the drag-and-drop Design Manager tool are responsive by default. If you break out of the Design Manager into custom-coded templates, all bets are off, so be sure to follow the CMS responsive grid docs. Is the CMS going to give you pixel-perfect mobile pages at every resolution? No, but it’ll get you 90% of the way there. Expect to do some light CSS work to fix a few things here and there. Most themes on the major CMS platforms these days are responsive by default, so this isn’t a massive differentiator, but worth a quick mention. 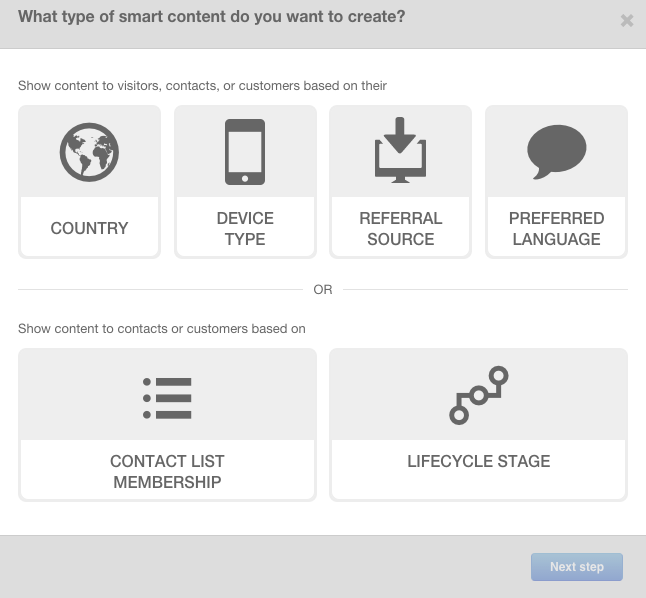 Smart Content is the most powerful feature of HubSpot’s CMS. The ability to personalize content and CTAs on your site based on what you know about a contact makes for a better user experience and, when done right, can skyrocket conversion rates. Brennan Dunn of Double Your Freelancing boosted sales by 70% just by personalizing headlines based on persona (e.g., freelancer vs. agency vs. designer). There are plenty more case studies on the impact of personalization if somehow you remain unconvinced. Contact list membership is where the magic happens since lists let you split contacts into super granular segments based on any data point you collect. Now, the ability to do Smart Content won’t automatically improve your site. Your success depends on your strategy and planning—putting in the hard work to truly understand your customer and figure out where the right personalization breakpoints should be. You have to gracefully tiptoe the fine line between too generic and Rube Goldberg. Consult a professional. Personalization gotcha: if someone accidentally auto-segments into the wrong persona, your website/emails/CTAs end up worse than generic. You can leverage Smart CTAs and progressive profiling (w/ forms) even if you’re not using the CMS. Simply embed them in your HTML and you’re good to go. Just make sure you have the HubSpot tracking snippet present on the page. Also, a few options have emerged that let you do website personalization based on HubSpot contact data without using the CMS. That somewhat diminishes this benefit but comes at an extra cost. 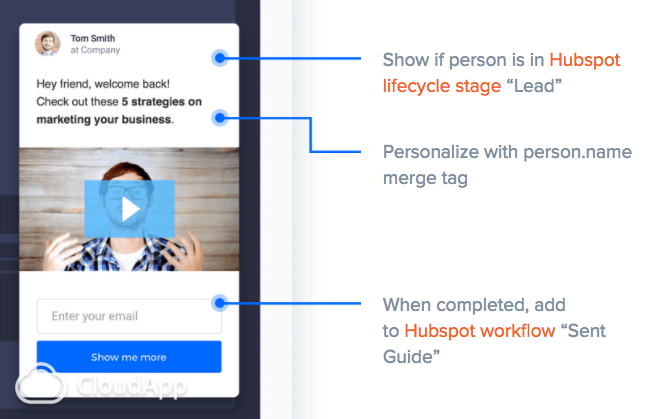 Is there a technical or UX advantage to HubSpot’s completely native personalization solution? I struggle to see one at the minute. AMP stands for Accelerated Mobile Pages. In a nutshell, if you use special markup on your pages, Google will load them instantly on mobile devices, giving the searcher a lightning fast experience. Google ranks these pages higher than non-AMP pages, and there is convincing evidence that AMPlifying your site can do wonders for your organic traffic. HubSpot rolled out a feature at INBOUND16 that allows you to enable AMP on your CMS-hosted blog with one click. No need to worry about manually marking up your pages. This is limited to the blog only and does not presently apply to Website Pages or Landing Pages. While AMP-in-a-box is nice, it’s not unique to the CMS. For example, you’ll find a very solid AMP plugin for WordPress which works not just on blog posts but pages as well. AMP for WP is updated frequently and has lots of features and gives you granular control, unlike HubSpot which is essentially an on/off switch. Many websites that are built on WordPress and other systems that are more DIY-oriented than the CMS are missing two extremely valuable components: a content delivery network (CDN) and SSL. As essential as these components are, they can be a royal pain to set up. With HubSpot, you get a lightning fast CDN without any setup at all and SSL encryption with minimal effort. This is a specific benefit over WordPress which, by virtue of its prevalence, has become a prime target for hackers. If you’re not using a web host that provides automatic upgrades and patching (including plugins), you can easily fall victim to one of the many exploits. Is the CMS impervious to hackers? No, of course not. But it’s niche enough to fly under the radar a bit. Also, its closed source nature might make it a bit more difficult for hackers to discover vulnerabilities. HubSpot has a lot of my stuff. If I ever want to switch to a new marketing automation tool, I have to figure out how to migrate all my contacts & companies, landing pages & thank you pages, analytics & timeline data (good luck! ), events, files in the file manager, and probably a few other bits that I’m not thinking of right now. That’s a boatload of work! Now add a full website migration to that list. I get quite claustrophobic when I’m too reliant on one platform. This is one of the main reasons why I rarely use the CMS for my main website. When you’re 100% all-in on HubSpot’s platform, the switching costs become exorbitantly high, making it easy for them to raise prices while keeping you handcuffed. For the record, HubSpot has never done this to me in 6+ years, but other vendors have. In addition to reducing switching costs, by hosting off-CMS, in the rare event HubSpot goes down, my landing pages, email, and workflows might be hampered, but at least my main site will be online. Diversification is a good thing. Designing and developing for the CMS is quite different than any other CMS I’ve used. Even for experienced web developers, it’ll take some time to learn the CMS parlance and dev workflow. None of this stuff is hard to learn, but it takes some getting used to. I’m still not as productive in the CMS as I am with WordPress or Rails. Luckily, the docs are really detailed and well-written. I have mixed feeling about HubL. Many marketing automation platforms leverage common templating languages like Liquid. I’m not entirely sure why HubSpot chose to go with something proprietary, but here we are. Lastly, I’ve found it hard to find really good CMS design and development talent until very recently, and it’s not cheap compared to WordPress talent. Hit me via email up if you’re in need of an agency that does stellar work on the CMS (there’s nothing in it for me). Have you browsed the HubSpot CMS theme library recently? Yikes. If you’re going to build on the CMS, be prepared to develop your own theme from scratch. While there are some decent one-off page templates in the marketplace, I’ve struggled to find any full site themes worth going with. On the other hand, there are thousands upon thousands of extremely high-quality WordPress themes to choose from. Even if you want something bespoke, you can usually find a great theme to use as a base. As plugins go, the WordPress ecosystem is enormous and the HubSpot ecosystem is tiny but growing. If extra plug-n-play functionality (membership, forums, checkout, analytics, etc.) is in your plans, the CMS is at a disadvantage. When I wanted to create a membership section of hubspotcourse.com, I installed Restrict Content Pro, gave it my Stripe key, and boom: full-on membership site with payment infrastructure for $99 (one-time fee). If I were hosted on the CMS, I’d probably still be building a custom system for managing logins. You can manually export your content from the CMS, but AFAIK, there’s are no Time Machine-like snapshots that include everything—page data, templates, stylesheets, files, etc.—and can be used to instantly restore a point-in-time version of my site. I want complete control over my website’s backup and recovery strategy, and you don’t get that with the CMS. I can’t think of any advantages to using a separate landing page tool like Unbounce or embedding HubSpot forms in WordPress pages. If you style your landing pages to match your WordPress theme, you can smoothly transition visitors from your main site to a HubSpot landing page hosted on a separate subdomain (e.g., info.varonis.com). Works great! I love the ability to give my whole marketing team access to Landing Pages and Website Pages so they can build campaigns and microsites, yet they don’t have (or need) access to modify our main site (homepage, product pages, etc.). The CMS simply isn’t built for e-commerce. At all. Build your site on Shopify and integrate it with HubSpot (or better yet use Klayvio). That said, I recommend the CMS for full sites more now than I have in the past. It keeps evolving and I’ve seen some really amazing sites built with it. Still struggling to make the call? If you’re stuck, please don’t hesitate to leave a comment or hit me up on Twitter and we can hop on Skype and work through your unique situation together. 👋🏼 This is a free lesson from my video course Mastering HubSpot. In just a few minutes a day, you can master the HubSpot growth stack with advanced strategies and detailed walkthroughs you won’t find in the Academy. Drop your email below to get more free lessons and a special discount. Or learn more about the course here.